When people ask Victor Provost how long he’s been playing the steel drums or “pan”, as it is affectionately called, his typical answer with a smile is “longer than I haven’t”. Victor began playing the pan at the St. John School of the Arts, in St. John U.S.V.I at just eleven years old, and hasn’t looked back since. When the School of the Arts’ youth band, Steel Unlimited II, disbanded in 1995, Victor set out on his solo career. By this time he was fourteen years old and had already performed in five different countries in North America and Europe with Steel Unlimited II. Having gotten an after school gig playing outside a local store, Victor’s popularity on the island grew quickly. Through high school he played at least five evenings per week at various venues, including the, once Rockefeller-owned, Caneel Bay Resort. In 1999 Victor was personally invited to the Umbria Jazz Festival by the festival’s artistic director, Carlo Pagnotta. Other acts at the festival that year included Milt Jackson, Jimmy Smith, Herbie Hancock, and Branford Marsalis. Upon his arrival in 1999, Victor began entertaining audiences at many of Pittsburgh’s local clubs including the world famous Crawford Grill (home base of such jazz greats as George Benson and Stanley Turntine), The Crawford Grill on the Square, James Street Tavern, and recently CJ’s and Gullifty's Restaurant. Victor has also toured Europe twice with the award-winning Real Silk Band and recorded with artists such as Ken Karsh, James Johnson III, Dwayne Dolphin, Tim Adams and Roger Humphries. In all, Victor has played over one thousand times in seven U.S. states, five caribbean islands, and in eleven countries. His diverse musical background of classical, jazz, blues, soul, and, of course, Caribbean music, has allowed Victor to develop a unique voice on his instrument. He seamlessly weaves melodic and harmonic phrases together during improvisation, often reflecting nuances of horn or piano lines. His genuinely authentic approach to caribbean music and intellectual approach to all other genres makes him one of the most highly sought after pan players in the region. 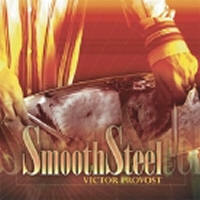 Victor most recently headed up the trio Caribbesque, which included Provost on pans, bassist Arnold Stagger, and drummer Dave Throckmorton. Both Stagger and Throckmorton have impressive resumes themselves, having played with such artists as the Mighty Sparrow, Maynard Ferguson, and Reggie Watkins.